In 2017, for the first time in recorded history, the number of individuals on this planet who are 65 years or older is predicted to surpass the number of individuals less than 5 years old.” 1 Like it or not, if you are reading this article you are part of an aging generation. 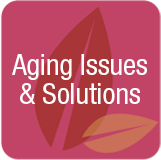 Aging and the associated wrinkles, gray hair and physical decline is viewed by society as negative. None of us want or hope to be “that old person”, yet many of us will be that person, one day. Those of us who work in the aging and healthcare industry are somewhat insulated, accepting aging as part of life, because most of our workday is spent in the company of older adults. No matter how old they are, we are younger; even if only by a few years. Removed from the protected environment of the workplace, a comment is made about age, and we are shocked to experience the same discrimination that our older clients experience on a daily basis. Let’s put this into perspective. If you have little experience with aging, how many times are you at the grocery store and see an older adult struggling to walk or fumbling for change at the cash register? Your first thought, rather than being one of recognition that you will eventually be that age, is one of impatience. You might then have an unkind thought about the mental faculties, appearance or dress or the older adult. The beauty of today is that we have the opportunity to change our tomorrow. Many older adults live fulfilling and fascinating lives; however this is not always the common vision. I was at the grocery store this past weekend. As I walked through the parking lot toward the store entrance, I noticed an older man, pushing his grocery cart circling the parking lot, clearly unable to identify the location where he parked his car. I doubt that anyone else noticed, or if they did, they lacked the insight that he was momentarily off course. My initial instinct was to walk up to him and to offer my assistance. Rather than dent his dignity, I decided against immediate intervention and decided that if he was still wandering the parking lot on my way out of the store I would offer help. Ten minutes later he was absent from the parking lot and I hoped safely on his way home. While many of us see frail elderly in public and wonder how they are able to manage, there are equally as many older adults who are not frail, but lead active and vibrant lives. Gene Cohen, one of the founding fathers of geriatric psychiatry developed a life theory of aging based on a potential for growth that occurred not in spite of old age but because of it. Cohen’s theory includes the stages of mid-life re-evaluation, liberation, summing up and encore that benefit all of us moving toward the end of the road.1 While some of the ages he frames may have changed slightly due to individuals postponing retirement, the concepts of the phases remain relevant. All any of us can hope for is that we are able to embrace and experience aging as actively and as energetically as possible. Common for persons in middle age, the late 30’s to the mid 60’s, is the idea of re-evaluating life, seeking purpose and ways to effect positive change. Research exists in many areas about individuals not reaching their full potential until well into their late 50’s, 60’s or 70’s. This is true of Albert Einstein, Ronald Reagan and many others. The idea of achieving one’s potential late in life potential bears hope for many of us who might be struggling today about lack of accomplishments or what we will leave behind as a legacy. Middle age is a great time to re-examine prior hobbies and to develop new interests that may be carried forward into retirement years. For many there is wisdom gained over the years and a sense of comfort in our own skin. There is a sense of liberation that occurs when one retires from formal work, categorized by Cohen to be the mid 60’s to the mid 70’s. Even if part time work, volunteer work or other hobbies continue after retirement, there is a sense that time is one’s own and that the boundaries of the time clock no longer exist. I know many retired adults who enjoy sleeping in late and others who are more active, engaged and interested in life than they were during their working years. Retirees have purpose and feel free to engage in new and experimental activities they may not have considered in the past. How many older adults do you know who now feel free to say exactly what they think? Many have arrived at the realization that there is no better time to experience life than the present. According to Cohen, the summing up phase occurs in in the late 60’s through the 90’s. This time frame is described by qualities of enhanced wisdom and a desire to contribute to the world or to leave something behind. Increased time may be spent with family and enjoying time with grandchildren. Some individuals engage in intergenerational activities by tutoring young students or participating in activities where they are able to give back to the community based on the experience of earlier years. I know of several couples who travel internationally in support of charitable work. The encore phase begins as early as the late 70’s and extends to the end of life. This time period for many is a period of looking back and one of personal reflection. Just because one may be less able to engage in physical activity during this phase of life it does not mean that one is unable to engage in individual pursuits like writing or in social pursuits supported today by the internet. I have personally met several centenarians, individuals past the age of 100, who were more engaged and active in life than some 60 year olds that I know. Many individuals during the last years of their life participate in a life review to arrive at closure that supports a quiet and peaceful passing. Because of the media and negative news about aging, it is easy to be swept into the slanted thinking, perceptions and discrimination that exist regarding aging adults. Each of us has the opportunity today to frame our later years by engaging in healthy and positive activities and to make plans for retirement years that are filled with interests and activities rather than isolation and the experience of poor health. We also have the opportunity to interact positively with those we know who are older to inspire them and to promote active engagement in life. Aging should be something to look forward to, not a part of life to be dreaded.